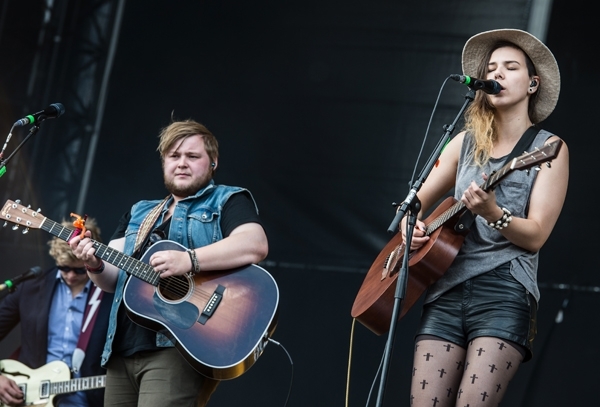 There aren't many pitfalls to having a critically revered smash song like "Little Talks," but Icelandic quintet Of Monsters And Men have discovered one of the few – a lack of free time. "This process is so new to us. We haven't been touring and trying to write before," the band's co-singer and guitarist Nanna Bryndis Hilmarsdottir told Rolling Stone backstage at KROQ's Almost Acoustic Xmas. "Usually it was just like, 'I have nothing to do, so I'm gonna sit down with a guitar.' Now you're definitely trying to find time between things." On this last run of tour dates, Hilmarsdottir decided to forgo the wild life of the road and sightseeing to focus on material for the follow-up to My Head Is an Animal. That dedication is starting to pay off with some songs that are looking good for the next record. "It's going to come together very soon," she said. But according to guitarist Brynjar Leifsson, the band hasn't quite started to write together yet, instead focusing on some needed downtime. "You spend your time at home with your family because you haven't seen them for months," he said. Whatever ideas the individual members have come up with will evolve once they begin writing as a unit. "I think we're all very stubborn people, so we are all full of ideas," Hilmarsdottir said. "I may have an idea, you may have an idea, but then it's not going to turn out the way I imagined, because we're five, and what's going to come out is the [composite] of the five." Hilmarsdottir knows that the album will be the next natural step from My Head Is an Animal. "I want to expand," she said. "There's no way we can create an album like we did. It's just the love child of that period, kind of, because we were [just] forming." After the success of "Little Talks," they won't be able to make the new album entirely under the radar like they did previously. "That album was made entirely out of 'Why not?'" Leifsson said. "We are in a totally different mindset, a different place than we were when we wrote our album," Hilmarsdottir said, "which is not good or bad. It's just different."